By John C. Toman. Posted September 10, 2012, 7:12 AM. As last night's thunderstorms wound down, forecasters are keeping their eyes on more clouds and moisture being funneled our way from a stubbornly anchored low in northwest Baja California. Convective clouds streamed towards the ocean yesterday afternoon as mid and high level easterly winds pushed thunderstorms off the mountains and into the inland valleys in at least three waves, the last of which came just before midnight. Reports from Sunday included downpours along the Elsinore Convergence Zone, stretching from Hemet to Lake Elsinore. A ten minute shower was reported in mid-Hemet in the afternoon near Mayflower Street. Hemet's Valle Vista received 0.81" in the 10pm hour. WeatherCurrents' Menifee location (in Sun City) registered 0.10" and Lake Elsinore got 0.28". The San Gorgonio Pass also got some heavy rainfall, with 0.54" reported at WeatherCurrents' Cherry Valley location. 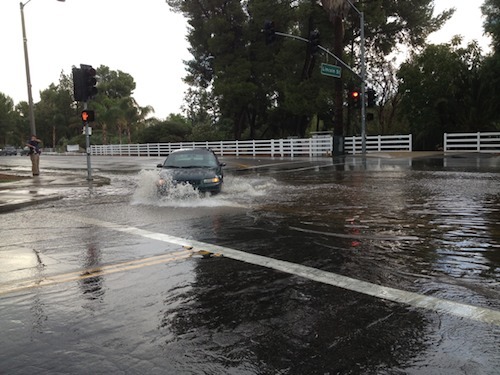 "I've never seen it rain that hard, " said Robert Leonard of Hemet. "We got .8" of rain in probably 10 minutes. Just about every trash can had been toppled or completely tossed across the street. Mud flow is everywhere as were the many branches and other debris from yards." National Weather Service reports included a landspout near Perris around 2:30pm, street flooding at Highway 74 and Lincoln in Lake Elsinore, and tree limbs on roadways in the Lake Elsinore area. De Luz also registered rainfall, at 0.12", and Temecula and French Valley took part in the evening wave, with 0.03" apiece. The evening cell also hit the wine country, which reported 0.13" (thanks Jim Sappington). Rain was also reported in Northeast Temecula (an impressive 1.16" there; thanks Michael Mojarro), along with some downed trees and power lines, perhaps from a microburst. And also in Central Temecula near Humber Street and Rancho California Road: two twenty minute downpours (thanks Michael Kirby for that report). Monday might feature even more widespread rainfall, with thunderstorm and shower chances extended through tomorrow night, as well as a flash flood watch that covers all of Southern California save the coast. Rainfall potential could be up to a half of an inch or more in some locations, but should be a tenth of an inch or less in most locations.